Butterfly Reflections, Ink. : Trick or Treat! Happy Halloween, friends! 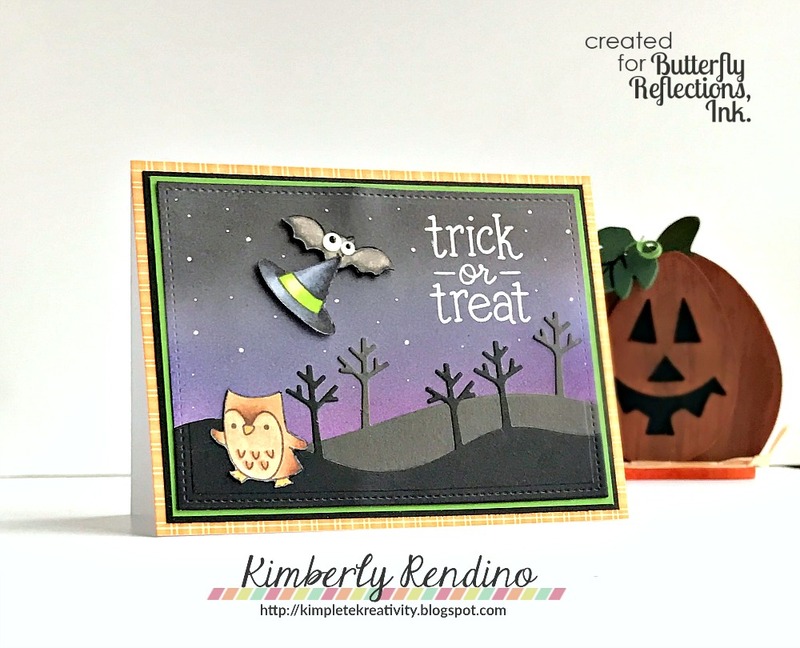 Kimberly here today to share a fun Halloween card using lots of supplies found in the BRI shop. 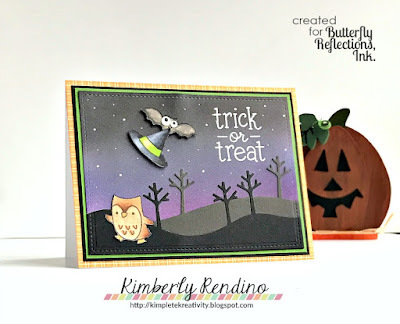 Most everything I used on this card can be used for non-Halloween cards as well - bonus! To create my background, I used Distress Inks to blend a night sky and added some stars with a Dylusions white paint pen. 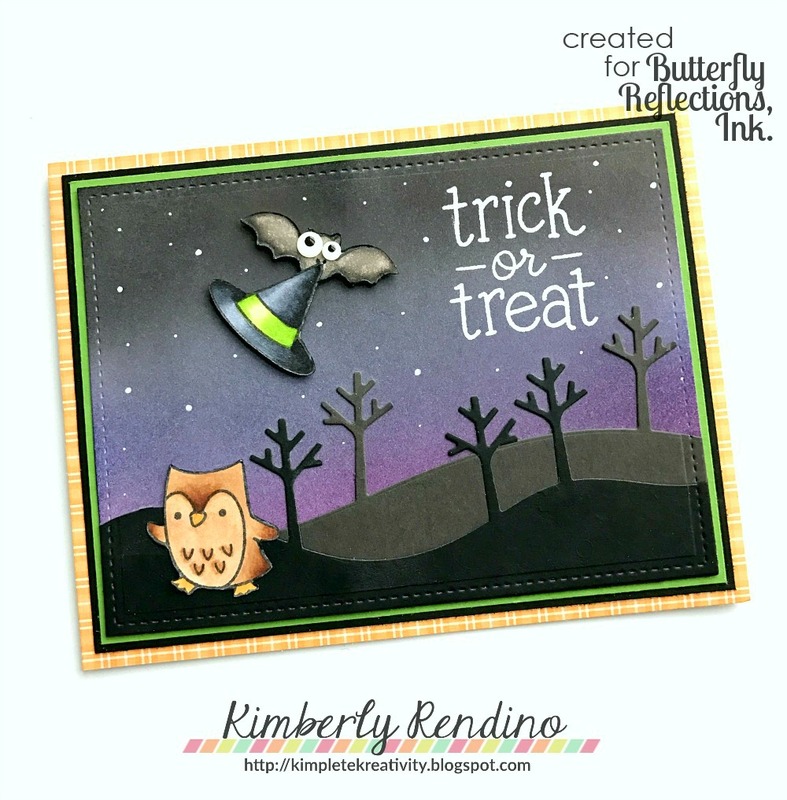 I stamped the sentiment from Trick or Treat with Versamark and heat embossed it with white EP. I die cut the tree borders from several colors of dark cardstock and adhered them to my background piece. I colored the elements in with Copic markers (owl from Jump for Joy, bat from Trick or Treat, hat from Hats Off to You). I mounted my panel to several colors of solid cardstock before adhering it to a piece of plaid paper from the Perfectly Plaid Fall 6x6 paper pad. I thought the bat stealing the owl's Halloween costume fit perfectly with the "trick" or treat sentiment!!! I hope you have a fabulous Halloween! My kids are getting older and my son says he isn't going trick-or-treating tonight - but we shall see. I think his need for candy will win out and he will be scrounging to put together a costume tonight at the last minute! In either case, I'll be enjoying passing out candy to the neighborhood kids, and having a fire with the neighbors as part of our Halloween tradition! Whatever you do, enjoy!! !